Senftenberg, Germany (CNN) -- Germany is often viewed as one of the most advanced countries in the world when it comes to protecting the environment. The landscape is dotted with wind turbines and many houses have solar panels on the roof. But Germany is also one of the largest energy consumers in the world with its high-powered economy, and much of that energy comes from coal fired power plants. Dealing with carbon emissions is a big challenge for energy companies and they are getting creative. European energy giant Vattenfall has installed a greenhouse next to a small plant in the East German town of Senftenberg where a team of scientists headed by Michael Strzodka is trying a new approach. They are cultivating green algae which they hope will eat the CO2 from the plant. Janine Thiele, a microbiologist says the concept is fairly simple: "Microalgae grow with photosynthesis, so they need light, they need CO2 and they need some nutrients like other plants." The scientists have large tanks filled with algae and nutrients and they take the CO2 emitted from the power plant and put it in the tanks. The algae filters the CO2 from the flue gas and uses it to build up biomass. First tests seem promising, the scientists say, but there are still more questions than answers. Power plants emit other gases aside from CO2, like sulfur, and it is possible the sulfur might kill off the algae or at least impede its growth. But team leader Michael Strzodka says his main concern is whether the process is economically viable: "The issue is: can we use this with an energy balance? Meaning, we must ensure we don't use more energy in the process than the algae will give us in concentrated biomass." It will take at least two years before Strzodka and his team will be able to answer this question. He says even if the algae solution works it will only help to clean the emissions from small power plants. Larger ones emit so much CO2 it would take massive amounts of algae to do the same job. The "Green Mission" project at Senftenberg is still in its early stages. Scientists are testing the effectiveness of different species of microalgae. 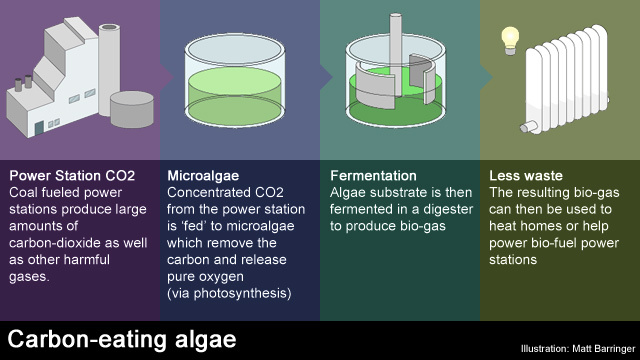 Their next step will be to examine the best uses for algae biomass. It could be used for energy, as an ingredient in animal feed, or algae lipids could be extracted to produce industrial grease. Other energy companies, like Germany's RWE, are also experimenting with the technology. The scientists at the green house in Senftenberg believe their algae could be a part of a solution to carbon emissions. Vattenfall is also exploring carbon storage technology where emissions are pumped into large tanks and then pressed into geological formations. Both the algae technology and carbon storage are still years away from having an impact on emissions, but as Germany moves away from nuclear energy, Markus Sauthoff, an executive with Vattenfall says cleaner coal energy will become more important: "As long as there is coal, it will be used -- and we can decide how we use it." Michael Strzodka and his team of scientists say they are just trying to achieve the next step, a bigger set of algae tanks to expand their research. He says he hopes one day the little green plants might help offer a solution to one of the biggest problems mankind faces today.